ALS, or amyotrophic laterals sclerosis, is a devastating disease for thousands of people in the country. Rapidly progressive, invariably fatal, ALS is a neurodegenerative disease that affects nerve cells in the brain and the spinal cord. It attacks the nerve cells responsible for controlling voluntary muscles (muscle action we are able to control, such as those in the arms, legs, and face). A-myo-trophic comes from the Greek. "A" means no. "Myo" refers to muscle, and "Trophic" means nourishment – "No muscle nourishment." When a muscle has no nourishment, it "atrophies" or wastes away. "Lateral" identifies the areas in a person's spinal cord where portions of the nerve cells that signal and control the muscles are located. As this area degenerates it leads to scarring or hardening ("sclerosis") in the region. In North America, ALS is also known as Lou Gehrig’s disease, named after the famous New York Yankee baseball player. The Iron Horse was diagnosed with ALS at Mayo Clinic in 1939, forcing him to retire and causing his death two years later. Today, many people are aware of ALS because of Stephen Hawking, the brilliant English theoretical physicist, cosmologist and author who suffers from the disease, or because they participated in the ALS Ice Bucket Challenge. About 5 to 10 percent of all ALS cases are inherited. The familial form of ALS usually results from a pattern of inheritance that requires only one parent to carry the gene responsible for the disease. Mutations in more than a dozen genes have been found to cause familial ALS. About one-third of all familial cases (and a small percentage of sporadic cases) result from a defect in a gene known as “chromosome 9 open reading frame 72,” or C9orf72. Now researchers at Mayo Clinic have discovered important clues about C9orf72. Here is the story. Mayo Clinic researchers conducted a statistical analysis to determine the degree of divergence in differentially expressed RNAs in patients with c9ALS (black) with those in patients with sALS (purple) or healthy individuals (green, controls). 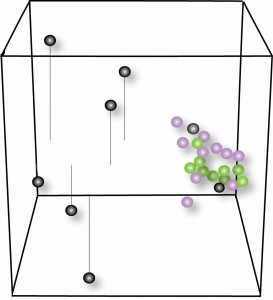 Changes in c9ALS distinctly diverge from the other two groups as the black circles are farthest from the purple and green circles. Each circle represents an individual included in the study, color-coded depending on its group membership, and shown in a linear transformation on a vector space (3-D cube). 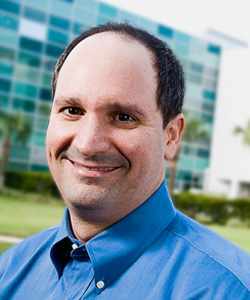 Researchers on Mayo Clinic’s Florida campus have identified key differences between patients with sporadic amyotrophic lateral sclerosis (ALS or Lou Gehrig’s disease) and those with the most common genetic form of ALS, a mutation in the C9orf72 gene. Their findings, reported recently online in Nature Neuroscience, demonstrate that ALS patients show abnormalities in levels and processing of ribonucleic acids (RNA), biological molecules that determine what gene information is used to guide protein synthesis. More than 30,000 Americans live with ALS, a condition that destroys motor neuron cells that control essential muscle activity, such as speaking, walking, breathing and swallowing. While increasing efforts are geared toward therapeutic development, an effective drug for ALS has yet to be identified, in large part because of our incomplete understanding of the disease. “Our results using advanced, modern laboratory techniques called next-generation sequencing, allowed us to acquire a library of new knowledge about patients with ALS,” says the study’s senior author, Leonard Petrucelli, Ph.D., chair of the Department of Neuroscience on Mayo Clinic’s Florida campus. 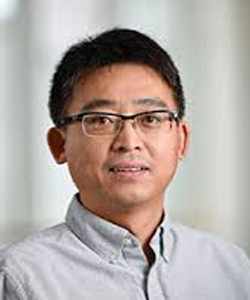 Dr. Petrucelli and Hu Li, Ph.D., assistant professor of pharmacology on Mayo Clinic’s campus in Rochester, Minn., led a team of investigators who carefully analyzed the RNA from human brain tissues. They found that ALS brains had numerous RNA defects, compared to nondisease brains. They also predicted molecular events that may be altered due to the changes found in RNAs involved in pathways regulating those events and that may contribute to ALS. Researchers used systems biology to generate networks that show the associations of differently processed RNAs in the cerebellum brain region of patients with c9ALS. 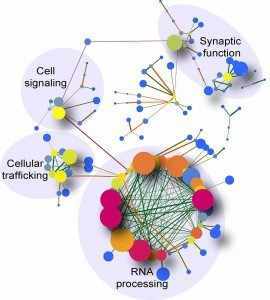 The main pathway affected in this brain region is that of RNA processing. 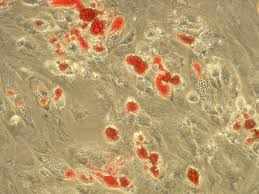 Cell signaling, synaptic function, and cellular trafficking pathways also were highly affected. Genes are represented in this image by nodes of different sizes and colors, which vary according to their connection degree. Edges are colored depending on their proximity and influence to other genes. While the researchers observed some commonalities, they also found many distinctions between the RNAs that were altered in sporadic versus C9orf72 mutation-associated cases. This suggests there may be different factors contributing to ALS in patients. The success of future therapies may need specific tailoring to the specific root cause of a patient’s motor neuron disease. Furthermore, the large volume of data obtained from their study, which was deposited into a public genomics data repository, provides a wealth of information available to other researchers to accelerate ALS research. Key to the success of their study was procuring samples from individuals who generously donated their tissues for research purposes to the Mayo Clinic after their passing. Close collaborations among the Petrucelli laboratory, Kevin Boylan, M.D., director of the ALS Certified Center of Excellence on Mayo’s Florida campus, and Dennis Dickson, M.D., director of the neuropathology laboratory on the Florida campus, facilitated access to these precious samples. The Petrucelli laboratory is conducting follow-up studies based on the data from this study to determine which alterations are important in ALS pathogenesis. The researchers also will study which alterations should be developed as diagnostic and prognostic biomarkers or as therapeutic targets that may offer hope to patients with ALS. This work was supported by the National Institutes of Health/National Institute on Aging (R01AG026251 and P50AG016574); the National Institutes of Health/National Institute of Neurological Disorders and Stroke (R21NS089979; R21NS084528, R01NS088689; R01NS077402; R01NS063964; P01NS084974); the National Institute of Environmental Health Sciences (R01ES20395); the Department of Defense (ALSRP AL130125); Mayo Clinic Foundation; Mayo Clinic Center for Individualized Medicine; ALS Association; Robert Packard Center for ALS Research at Johns Hopkins; Target ALS; Canadian Institutes of Health Research; Siragusa Foundation; Robert and Clarice Smith and Abigail Van Buren Alzheimer’s Disease Research Foundation; and Donors Cure Foundation.